General Powerful battery operated vacuum lifting device for the laying of marble and granite slabs, concrete and the like. 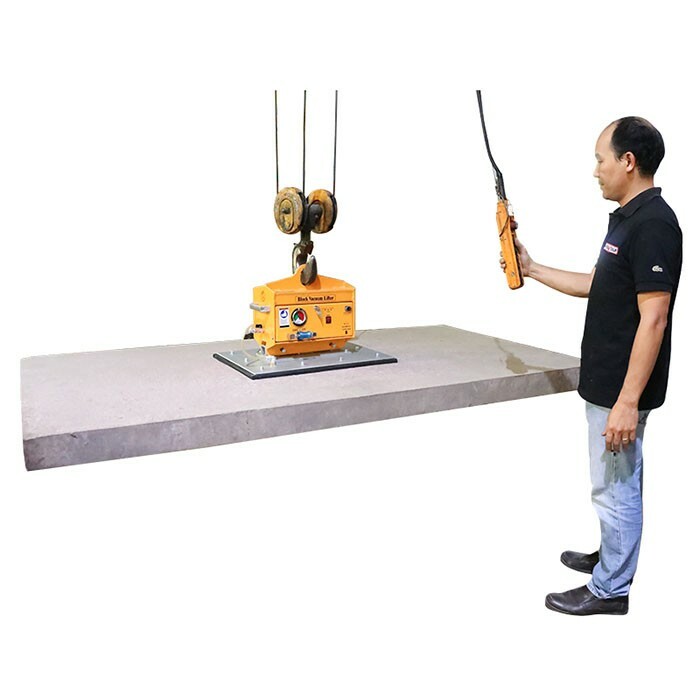 Robust and compact, the Aardwolf Block Lifter can be suspended on all types of lifting equipment by means of load hooks, chains, cables and the like. Features The Aardwolf Block Lifter 1000 kg is equipped with two 12v 4A battery operated vacuum pumps. Suction plates slide on and slide off, so plates can be changed in less than one minute. Safety features: Flashing light to warn of low pressure, vacuum gauge, safety vacuum storage tank, acoustic warning device. Pressure switch control system automatically and starts the vacuum pump after start of loss of pressure. Power saving control system allows the battery to last for one working day. Battery charge indicator indicates battery charged level. Manually operated valve for vacuum. Specifications Battery information - Power supply:12v 24Ah battery - Charging requirements: 12V 3A - Standby time: 5000h - Charging time: 8h - Non-stop working time: 4.2h - 6-month capacity Motor information: - Vacuum Flow Rate: 32.5 l.min - 2 Motor: 12V 4A Vaccum pad dia: 800 x 500mm W.L.L: 1000kg Note: For shipping weight add weight of selected pads to package.